Yesterday, we stopped by the local pumpkin patch so Swee’Pea and TheMonk could pick out their pumpkins. The patch had separated the pumpkins by size but they also had a small section where loose pumpkins, most small, were laying on the ground ready to be picked up. We headed over to this section and turned Swee’Pea and TheMonk loose. They were very excited and ran over to pick up the first pumpkins they saw. Wanting them to get a little out of this experience, we encouraged them to roam around and look for a pumpkin to take home. Soon enough, Swee’Pea had settled on her pumpkin and TheMonk had settled on his. Now, the more experienced pumpkin chooser might suggest that Swee’Pea and TheMonk have a ways to go when it comes to choosing the perfect pumpkin. I prefer to think of Swee’Pea and TheMonk as bucking the status quo. They are trend setters, not trend followers. Why would they choose a boring, everyday-looking pumpkin, when they can choose a unique, one-of-a-kind pumpkin that is unlike any other pumpkin adorning the porches of American cities this week? Perfectly orange pumpkins are so passé. Pumpkins that aren’t rotting out the bottom are too mainstream. 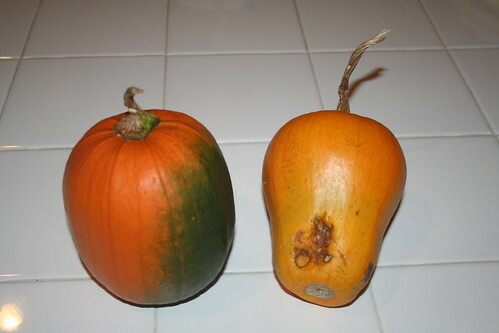 Swee’Pea and TheMonk are taking Halloween traditions and turning them on their gourd. But don’t take my word for it. I give you photographic proof of the pumpkin choosing ability of my kids. TheMonk’s on the left and Swee’Pea’s is on the right. It’s been four and a half months since the twins turned two. And in that time the kids have been… *whisper*frickin’ easy. I mean it. Sure, they would whine every now and then. They’d smack each other every now and then. But they were nothing like Sarah’s kids. But lately? Oh. My. Heavenly. Father. Swee’Pea is on the verge of becoming a certified WHINER. The only reason she hasn’t shifted into full-time whiner status is that Mommy and I refuse to play that game. The minute she starts whining is the minute we stop caring. You’d think after 2,123,952 times of not getting what she wants using the whine technique, she’d try something else. No such luck. The girl is convinced this will work. You gotta love her perseverance. TheMonk, on the other hand, has suddenly realized that a) he is DA BOMB and b) he has choices. Yes, TheMonk projects a ‘tude. It’s quite a sight to see all 33 inches of Monk strut around the house like he owns the place. He has this mischievous smile that says “I’m cute. And now I will use that cuteness for evil.” It’s a bit disconcerting. And even more difficult when punishing the kid. It’s like punishing a puppy. You don’t want to rub his face in it, but it’s the only way he’ll learn. “no. No. NO. NO! NO! !” A crescendo of negativity that would make Nancy Reagan proud. Last night… Or, as many of you might know it… EARLY MORNING! TheMonk decides to wake up and cry out. I jump out of bed and head down the hall expecting to pat him on the back, give a few “there… there’s” and I’m back to dream land. TheMonk had other ideas. He wanted to go downstairs. (sound familiar?) The only difference between this time and last time was this time it was 2:15 in the freakin’ morning! Daddy was not in such a mood for cuddle time. Not that I didn’t try. I did try. Only I was hoping to sleep while we got some cuddle time. But TheMonk was adamant. He wanted to go downstairs. Finally, after cajoling, suggesting and downright begging for him to go back to sleep, I picked him up and plopped him in his crib. As my head hit the pillow, I could hear him screaming. The clock said 2:52 a.m. About forty-five minutes later he finally had enough screaming. As TheMonk found out, it’s a little bit harder to practice free will when you’re stuck in a crib. While fires continue to rage in other parts of the county, the fire that threatened my neighborhood has been controlled and no longer poses a threat. As we try and get back into a routine I cannot forget the fear and uncertainty that permeated our household for a day or so. I don’t want to forget because those who are still in danger or, even worse, lost their homes will have so much rebuilding to do – in both house and spirit. For those of you who have followed my short encounter, thank you for your concern and support. It really is amazing the connection I have made with so many of you through this blog. It was nice to know that we had offers to move to both Memphis and Wisconsin if needed. That’s the kind of people there are out there and it’s very nice to know. I hope that the other 1,000+ families who have lost their homes have people looking out for them as well. If you would like to help make a difference from afar you can donate to the American Red Cross of San Diego and those donations will help support the recovery of San Diego. On another note, this experience really teaches you what’s important in life. My wife and I spent so much time and energy purchasing and moving into this home. We’ve filled it with memories but we ‘ve also filled it with furniture, electronics, knick knacks and a lot of toys. Stuff. But in the end the only things we packed into that car were things that had sentimental value. Old track medals. First locks of hair. Photos. If you had to pack up on a moment’s notice, what would you take with you? As many of you know, Southern California has been hit hard with wild fires. I am currently at home because the neighborhood right next to mine has been issued a voluntary evacuation notice. Right now, the fire approaches from the east but there is a lot between us and the fire – including a small lake. Ashes are raining down from the sky and we are running our air conditioner to keep the inside of the house from being too smoky. Right now, we have all our bags packed and sitting next to the door. We’ve already loaded the important papers and computer backups into our cars and should we receive word, could leave in under 10 minutes. Swee’Pea and TheMonk sense something is up. They refused to go down for a nap this afternoon – even though they are clearly tired. Perhaps it’s the urgency of Mommy and Daddy as we discuss what to take and what to leave behind. We remembered the hand prints we took of the twins at 3 weeks. We remembered our wedding photos. I remembered my father’s cuff links, now tucked into my overnight bag. It’s kinda strange deciding what parts of your life deserve saving and what can be left behind. In the end, there aren’t a lot of things that are all that important. Our friends Kristie and Chris, who live in an area unaffected by the fire have offered us refuge should we need it. Right now, however, we wait. Swee’Pea and TheMonk are watching Dora while we follow the news on-line. Our county has a “reverse-911″ phone system that will call us should we need to evacuate so we’ll get prompt information. Thank you to those of you who have emailed and left comments stressing your concern. We are fine and in good spirits. But say a prayer for the 500+ families (and counting) who are currently homeless. No one deserves to lose their home like this. UPDATE #1: 8:00 p.m. I just watered down the exterior of our house. I can see the hills a few miles away are glowing orange in the night. Hills to the north are glowing as if a sun rise is eminent. The neighborhood is buzzing as people pack their cars and prepare to leave. A neighborhood a couple of miles north has been issued a mandatory evacuation making things a bit more tenuous here. As I see it, however, the fire will have to get through a couple of neighborhoods before it gets to mine but as I watch the news I see that that exact thing has been happening all over the county. Swee’Pea and TheMonk are asleep right now, we have packed both cars with everything we need and we are ready to get out when asked. UPDATE #2: 8:00 a.m. Tuesday. The fires burned over the mountains to the north and east of us last night. Every community to the north and to the south have been issued evacuation notices (some mandatory, some voluntary). We have yet to be issued one but are on standby. We have been saved by the lake to the east of us today. The fire to the south, however, has a straight line to our community through some open space and parks. It’s very likely we will be evacuating at sometime today. Swee’Pea and TheMonk are doing fine. Swee’Pea is her usual grumpy morning self and TheMonk just got excited seeing fire trucks on TV. We have switched to watching Dora right now to pass the time. Thank you all so much for your good wishes and prayers. We really appreciate it. UPDATE #3: 11:00 a.m. Tuesday. Swee’Pea and TheMonk are down for a “nap”. This is a bit unusual for them in that they are now napping in the same room as we have put the pack’n'plays into our car. They usually nap in separate rooms because they distract each other and don’t sleep. This is turning out to be one of those days. I’ve heard Swee’Pea tell TheMonk, “That’s not very nice, Monk.” about three or four times. They are both shouting “NO!” at each other so not a lot of sleep is going on. Sleep would be nice since we don’t know when we’ll need to get out of here. I am feeling a bit optimistic right now as the high winds that were driving this fire for so long seem to have died down quite a bit. Finally helicopters are allowed in to drop water and that is helping quite a bit. We’re still in good spirits! Oh, and a shout out to a certain 5th grade class in Wisconsin. Doesn’t California sound wonderful? UPDATE #4 4:00 p.m. Good news. Firefighters have done a great job in our area. Some of the back fires they lit, combined with the shifting of winds, has helped keep the fire under control – just as it approached our surrounding neighborhood. We just got word via the television that those neighboring communities near us that had been evacuated are now being allowed to return. It seems the worst is over for us. Of course, we will continue to monitor the situation but it appears the worst is over for us. Unfortunately, the worst is yet to come for over 1,000 families who have lost their home. Keep everyone in your prayers – and thank you for all of the support and encouragement you have provided over the past couple of days. The time is 8:32 p.m. I notice the time because TheMonk begins to cry in his crib. It’s been a rough past couple of days for TheMonk. He’s fighting yet another cold and it has drained him. I remind him that it’s night time (he’s been in bed for an hour and a half) and that it’s time to go to sleep. I am firm. I gently rub his back and exit the room. He continues to cry. I listen for it to die down. After about 10 minutes it appears he’s going to finally calm down. Instead, he finds a second wind and screams yet again. Feeling like I should go in, I enter and again rub his back. He is hysterical now and sobbing heavily. I pick him up and he wraps his arms tightly around my neck. His legs wrap around my torso and he squeezes me harder than he has ever hugged me in his life. I squeeze back and kiss his wet cheek softly. He protests as I lay him down and once again, as I close the door behind me, he begins to scream. Once again I let him cry. Andrea is out for the evening and I don’t have her to consult with. My mind goes over all the parenting books I have read and I decide to let him cry a little longer. I don’t want to reinforce this behavior and have him crying for the next week. But after another 10 to 15 minutes of screaming I can’t take it anymore. I rationalize that if I don’t actually take him downstairs, that would be okay. I creep into his room and scoop him up while Swee’Pea tries to sleep in the next crib. I carry TheMonk out to our loft area and position myself on the chaise section of our sofa. I hold him in my lap and and we snuggle on the chaise, letting the sounds of the fish tank fill the room. TheMonk has stopped crying and he places his little hand on my hand and rests his weary head against my chest. I kiss his damp forehead and hold him tighter. My mind wanders back two years to a time when we would often have early morning snuggles after a feeding. I think back to the times when I would hold my baby boy in my arms in this very spot and how I never thought I’d get to feel that again. Now that I have wiggly two-year-olds, snuggling is few and far between. It turns out, my little boy, that you didn’t want to go downstairs. No, it turns out you wanted to spend some time with your Daddy. We lay there while you asked me questions in an effort to prolong the moment. “Where’s my car at?” you ask. “Where’s my mask at?” you ask. “Is Swee’Pea sleeping?” you wonder. You turn over and I pick you up as you squeeze my neck again and rest your head on my shoulder. I rest my cheek against yours as I carry you to your room. I give you one last kiss and place you gently in your crib – cherishing each moment – holding on to this memory of love and warmth that I so want to be a part of your life forever. I place your stuffed monkey under your arm and I quietly tip-toe out of the room. I can hear you getting comfy and settling in to finally sleep. You didn’t want to go downstairs. You wanted to be with your Daddy. Your Daddy wanted to be with you too. Swee’Pea and TheMonk have been on this earth for over 750 days and it has rained maybe 10 times where we live. I can distinctly remember pointing out the phenomenon of rain only once or twice before and they did not remember it. I know this because it rained this morning and were they ever amazed. As we prepared to go to daycare, I put on their coats and we headed out the door to the garage. I had already opened the garage door and they could see the light mist falling to the ground. Of course, they instantly became curious and desperately wanted to go see what was going on. I was mindful of the time and thought about just herding them into the car. There were places to go and people to see. But the amazement on their faces made me stop and think. Instead of placing them in the car, we ventured out for a closer look. Before I knew it we were twirling circles in our driveway while looking upwards towards the heavens. The cool mist fell upon our faces and the laughter and squeals of two, two-year-old toddlers made me feel alive with the wonder in their voices. “It’s RAINING!” shouted Swee’Pea with a sense of excitement in her voice as she tilted her head back and let rain fall upon her glowing face. I looked at these two and marveled at how the simple things can produce such joy to a little one. It’s a lesson I want to learn from my kids. Life is not about rushing from task to task. It’s about living in the moment and relishing the simple – yet very fulfilling – things. The lessons I learned to day? Let’s not just take time out to smell the roses but let’s take time out to dance in the rain. Let’s say it is your job to clean up the downstairs. Let’s also say that you have two, two-year-old toddlers who feel it is their sworn duty to ensure that every imaginable space is occupied with a toy, crayon or old sippy cup. It is also late at night and you have no energy to put anything away. Would you then, without a second thought, shove as much toddler mess as you could under the couch and then go to bed? Would you then be prepared to blame your kids if your spouse discovers the pile under the couch? Honey, please don’t look under the couch. It is early morning and I am feeding two tired toddlers their breakfast. This particular morning I had to wake them up from their deep slumber. This seems to be happening more and more now that it is still dark when I have to get them up. While TheMonk seems to adapt fine once he’s awake. With Swee’Pea? Not so much. Breakfast time, I have down to a science. We do a bowl of oatmeal followed by some fruit and, finally, yogurt. They know this. This is our routine and most days it is a welcome routine for everyone. Not so today. From the very moment we sit down Swee’Pea begins to whine cry scream that she wants yogurt. NOW. Today Swee’Pea is not going to ask for anything in a calm voice. I pretend I’m in charge and I give TheMonk his oatmeal and try and help Swee’Pea get started on hers. Oatmeal, in case you were wondering, is NOT yogurt. This becomes evident to me because the volume in which she was screaming “I WANT YOGURT!!! !” is hard to ignore. She is right. It isn’t yogurt. I do manage to calm her down enough to get her to eat her oatmeal but it isn’t easy. After every few bites of oatmeal (pronounced, in our house, “eatmilmull”) she screams again about wanting yogurt. You know, in case I have forgotten. We finally get through the oatmeal and I give her a small amount of fruit in an effort to make this phase go by quickly so she can finally get her beloved yogurt. This plan works as she scarfs down a couple of sliced apple pieces. FINALLY. We get to the yogurt. Swee’Pea knows this. She sees me pull out the container of yogurt and I can tell she is excited. Her eyes lock on to the container and she waits as I approach with spoon in hand. I dip the spoon into the container and come up with the… perfect bite. She knows this is what she has been craving since the moment she woke up that morning. She is finally going to taste the yogurt. After 15 minutes of screaming, I’m finally going to be able to make my daughter happy. I have done my part in being resolute but now I can revel in the happiness that this bite of yogurt will give my beautiful little girl. I guide the spoon to her lips as I anticipate her ravenously swallowing the entire amount. Except the girl won’t open her mouth. “Don’t you want yogurt, Swee’Pea?” I ask. She replies in a manner that suggests I should know what the answer is going to be. The teenage years are going to kill me, aren’t they? Swee’Pea has a new favorite song. Whenever she hears Fergie’s Big Girls Don’t Cry, she smiles and rocks back and forth. Lately, I’ve been singing the song to her when taking a bath or feeding her breakfast. I must do a pretty good rendition because not only does Swee’Pea do a little dance but TheMonk will often join me in a Fergie-esque duet. We’ve downloaded the song on our iPod and play it whenever the mood strikes. When she hears it, she gets quiet and grooves to the music, her eyes in a faraway land. Today, as I picked the twins up from daycare, the song happened to be on the radio as I buckled her into her seat. “What song do you hear, Swee’Pea?” I asked. “If big girls don’t cry, Swee’Pea, then who cries?” I ask. “Babies Cry.” she says matter-of-factly. Or was it just me?